Songs and fingerplays are your best friend for teaching language in preschool speech therapy this fall. Do you sing with your pre-k students? You should! Children really don't care if you sing like a bird or are a little off-key. They just love the experience. Little ones don't judge, so if you're not already singing with your young students in speech therapy, you need to give it a try. 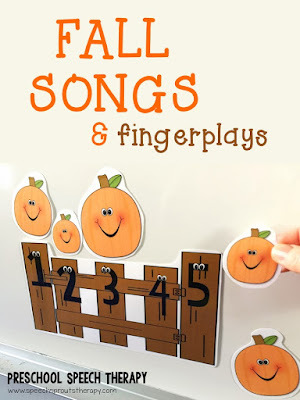 I'm going to share some of my favorite songs and fingerplays for Autumn, and resources you can use to create a whole themed unit around many of them. Why should you do fingerplays and songs with preschoolers? 1. Catchy but simple music gives children the opportunity to hear and practice the rhythm of language. What a great way to work on prosody! Repeated practice with pitch, rhythm, and tempo are built right in. 2. Songs and fingerplays that feature repetitive lines give children repeated exposure and practice with vocabulary and sentence structure. The repetition makes it easier to learn the lines and for children to participate. I find my minimally verbal students who rarely speak or those who are at the 1-2 word phrase level will often sing a few lines along with their favorite songs. It's a great beginning to practice sentence structure, vocabulary, and turn-taking. 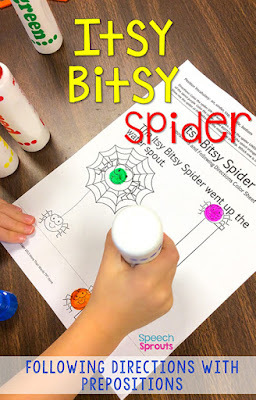 I sing the first part "The itsy bitsy spider went...." and my students will fill in the blank with a multi-word phrase! 3. Songs with motions and fingerplays are a great vehicle to combine fine and gross motor movements with language practice. It's multi-modal learning in such a fun and natural way. Who didn't love Head, Shoulders, Knees, and Toes as a child? We sing, we touch and we move- all the while learning to name body parts. Plus, you're burning a little energy and providing movement so the children are ready to attend to the next activity. 4. Practice with rhyme builds phonological awareness. Many of our favorite songs and fingerplays rhyme. Rhyme is an important building block for early literacy skills. Sing the song, point out the rhymes, and generate a few more rhymes, all the while having great fun. 5. Build auditory memory and sequencing skills with cumulative songs and rhymes. Songs like The Farmer in the Dell or Going on a Lion Hunt require the singer to remember and sequence the previous lines. I love to use pictures, toys or finger puppets as visual aids to help children sequence as they sing. 6. Songs and fingerplays for the preschool crowd often fit in beautifully with theme-based learning. 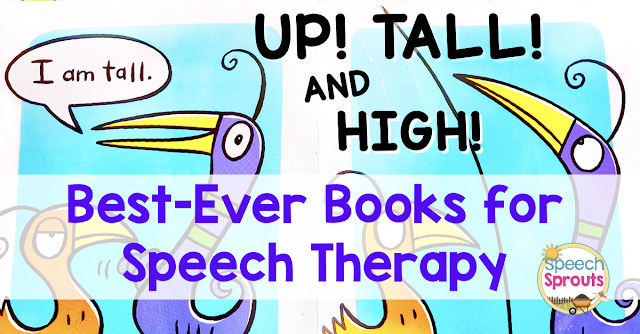 Using themes in therapy helps build associations, vocabulary and a rich vocabulary. There are so many great songs and fingerplays that will fit right in. How do you find those fabulous fall fingerplays and songs? Many of the classic songs and fingerplays are have been done as music videos and are on Youtube. Watch the videos to hear the melody and learn the lyrics. 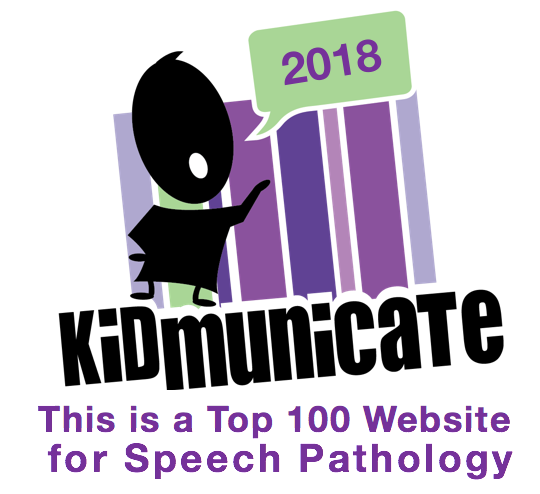 Keep in mind that for children who have speech or language disorders, many available renditions are too fast to allow those who need extra processing time to participate. Look for those that have a slower pace, especially when your students are first learning the rhyme or song. Check out the numerous websites that have lists of songs and rhymes for preschool. 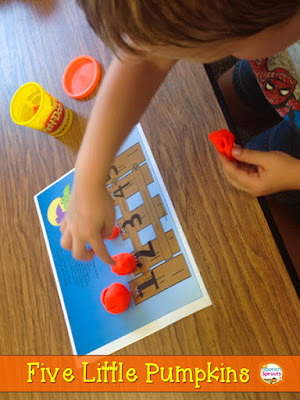 A quick search will yield tons sites with fingerplay and song collections for the preschool set. 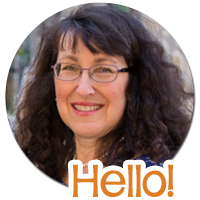 Here's a great one: Take a peek at the Preschool Express This is a free site owned and operated by the wonderful Dr. Jean Warren. This site has a music and rhyme station plus games, art and themes galore. Michigan State University Extension also has a Fingerplays and Songs for Childcare Database you can search if you're looking for the words or just something new. Write down the lyrics of your favorite songs and fingerplays for quick reference when you're ready to use them. An index card or page per song will make them easy to organize and find if you alphabetize them. You might want to keep cards of each season or theme together on a ring for easy reference when you are ready to go during your session. How to teach the songs and fingerplays to children who have speech and language challenges. Pre-teach the lyrics and motions at a slower pace. Learn the song or fingerplay before you watch the video or listen to the music. Your children will have more confidence and success with repeated practice modified for your students. You'll model, cue and scaffold just as you do with sentences and conversational speech. When learning a new song or fingerplay, sing or recite at a slower pace, and learn the lyrics and motions one step at a time as needed. Once your children learn the fingerplay or song, it's fun to play a slightly faster video and they'll be more ready to follow along. Visuals can include objects, stick puppets, magnet board pieces or the Youtube videos I'll share with you, or all of the above. Visuals help children with sequencing and memory for the lyrics, and re-telling too. Favorite fall fingerplays and songs round-up! I've gathered some of my favorites for you and I'm including links to many videos and sites where you can learn them and enjoy following along with the videos. I love following up the songs and rhymes with themed activities. 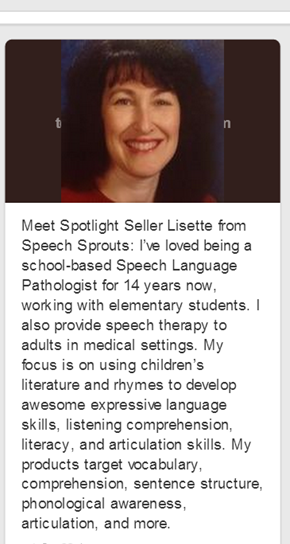 Take a peek at Speech Sprouts Fall Speech Therapy Activities Pinterest Board for inspiration on activities and crafts. Save your favorites to your own boards so you can easily find them later. 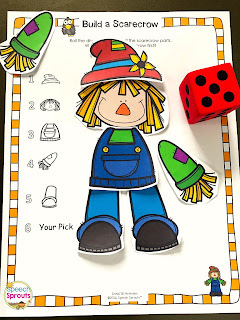 You may want to save time and have coordinating activities ready to go, so I'll give you a peek at my favorite fall preschool speech and language activity packs too. They always cover a variety of targets so you'll have several sessions full of speech and language activities ready to go for each theme. This fingerplay teaches fall vocabulary: leaves, falling, rake, pile, jump. Autumn Leaves by The Kiboomers is a nice slower rendition of the song, good for children with slow processing or apraxia. Autumn Leaves by The Learning Station The pace is a little faster and has fun harmonies. The cartoon character demonstrates the fingerplay as they sing. Fall is harvest time on the farm and Farmer in the Dell is fantastic for sequencing and auditory memory as children recite each animal sound. The Farmer in the Dell by Mother Goose Club Playhouse is a cartoon video with the traditional lyrics. It has some slight pauses between verses, which I really like. Another adorable The Farmer in the Dell video is by Super Simple Songs. This version features a cute redheaded girl farmer and has lyrics about farm activities like milking the cow and planting the seeds. Enjoy this slightly spooky fingerplay and talk about ordinal vocabulary (first, second, third....) with your students, then follow up with bright orange pumpkin-related activities. The Five Little Pumpkins by the Kiboomers is a colorful video done at a slightly slow pace which is terrific for teaching the fingerplay. For a super pack with oodles of speech therapy materials to go with this rhyme, check out my Five Little Pumpkins Speech and Language Activities pack. Way up High in the Apple Tree by The Learning Station I love this simple rhyme and fingerplay for teaching the concept of "up high." It's sound-loaded like so many of these rhymes and songs making it great for articulation practice of /w/ (way), /h/(high), and /sm/ (smiling). 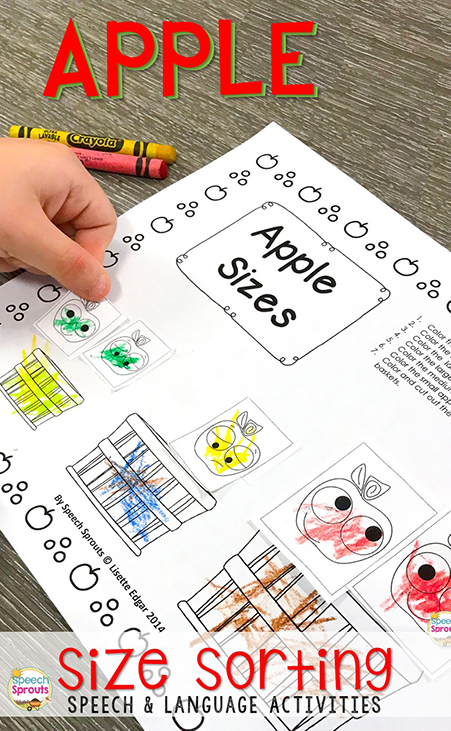 For more apple speech and language activities see Apple Apple Reader and Speech Therapy Activities which includes a cute printable cut and paste reader targeting "where?" questions: Apple, Apple where can you be? I really love The Owl fingerplay from A to Z Kids Stuff. So cute! It has the actions written out for you. Five Little Turkeys is the perfect song for your Thanksgiving theme. The Learning Station's Five Little Turkeys starts out slow and then increases in speed as it repeats. 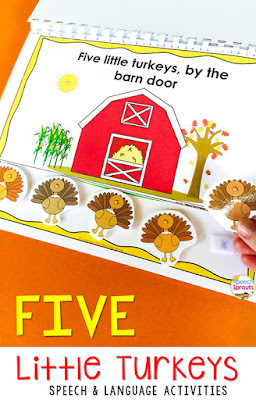 My Five Little Turkeys Speech Therapy Activities includes this interactive flipbook so your children can make those turkeys "waddle off" as they count down. This pack has activities for the concepts of same and different, matching, prepositions, associations and Where? questions too. I'm a Little Acorn This is a lovely video by DanceandBeatsLab that combines the music and motions into gentle dancing movements. Grey Squirrel Sung by the Learning Station will have your little ones swishing their bushy tail as they repeat the song with mama squirrel, daddy squirrel, baby squirrel, grandpa squirrel, and grandma squirrel. Great for the /sw/ blend and "sh" practice (swish, bushy). One of my all-time favorites, Bear Hunt has plenty of fun actions, works on sequencing memory and yep- prepositions too. The hunters go through, over around and more. Plus its got a dark cave with a scary bear! No list is complete without the Itsy Bitsy Spider. Or Eensie Weencie Spider if you prefer. Target sequencing and the prepositions up and down in this gentle little song about a not-so-scary spider. Itsy Bitsy Spider by Twinkle Little Songs is a pretty rendition of the rhyme. It has a just-right slightly slow pace too. The Itsy Bitsy Spider by Patty Shukla is a bit faster. It combines the rhyme with body parts vocabulary as that little spider wanders off! You'll find plenty of spidery speech and language activities to go with the song in this pack: Itsy Bitsy Spider Speech and Language Therapy Unit. Scarecrow, Scarecrow by the Learning Station Turn around, reach up high, bend down low...this is another version that increases in speed each time the verse is repeated. This cute little fingerplay targets fast and slow. Watch Dr. Jean demonstrate Two Little Blackbirds in a video sponsored by ESC Region 13. This classic song and fingerplay targets part-whole by talking about the parts of the bus, repeats "wheels" and "go" for /w/ and /g/ articulation practice and opposites (up and down, open and shut). Wheels on the Bus by Cocomelon (ABCkidTV) I like the slower pace of this video and love that the bus is a school bus filled with a family and animals too. The cute realistic characters demonstrate the fingerplay motions for you as they go for a bouncy ride. The Wheels on the Bus by DanceandBeatsLab is a faster and more energetic rendition of the popular fingerplay sure to get those wiggles out for children who can follow the faster pace. It combines the song with fun dance moves your children will love. I have two resources for you full of speech and language activities for Wheels on the Bus. 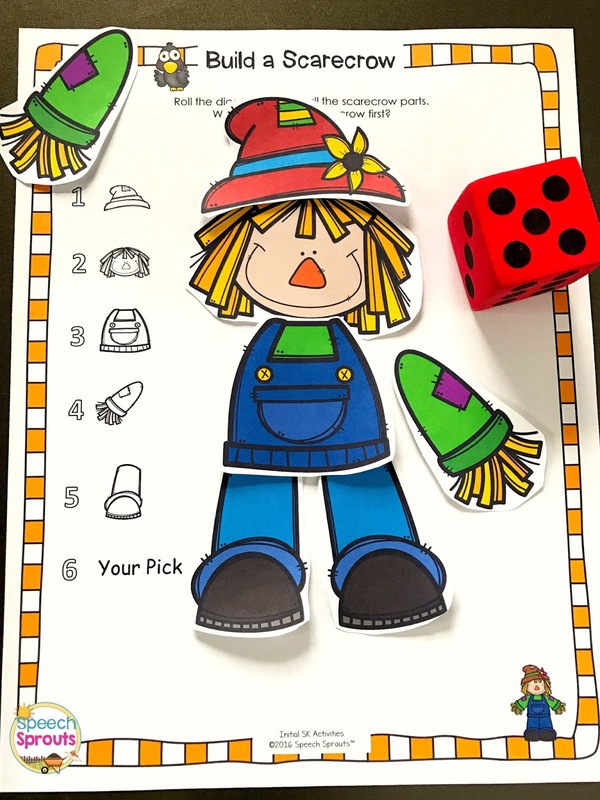 Wheels on the Bus Speech and Language Activities includes printables plus an interactive no-print story for your tablet or interactive whiteboard. 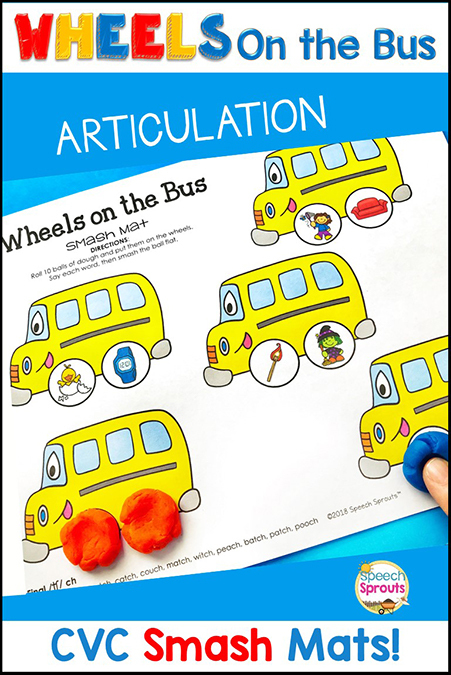 This CVC Articulation Smash Mats with Wheels on the Bus lets children enjoy smashing the play dough to make wheels as they practice articulation in initial or final word positions. A BW version works great for dot markers and this activity is no-prep easy peasy. Read this post for more great ideas to go with this rhyme: Wheels on the Bus: Transportation Week! I hope you've enjoyed this autumn round-up of songs and fingerplays! Leave a comment with your favorite songs, rhymes and fingerplays for fall. I'd love to find some great new ones. Until next time my friends, happy fall!